The Explorer Preschool Play Loft offers a variety of activities and possibilities that are sure to engage just about every student. This versatile indoor play area expands your activity space in a safe, efficient and creative manner. The steps and extra-large platform are carpeted for comfort and safe traction. A lower handrail on the steps enables little ones to remain secure and balanced as they go up or down. 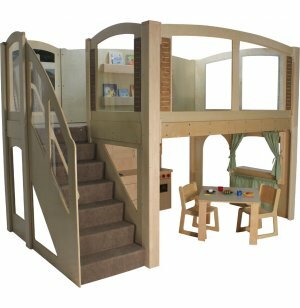 This play loft has the perfect configuration for placing a quiet reading space above and an activity center below. The platform includes a mirror and a book display, while the lower half features a puppet theater/store panel and an arched doorway. Indestructible polycarbonate windows on the top make it easy for caregivers to supervise children as they play. These indoor play areas are built for decades of fun with durable solid maple and Baltic Birch plywood protected by three coats of eco-friendly waterborne finish. The rock-solid construction, extremely durable materials and beautiful hand craftsmanship ensure that this is one of the most elegant and long lasting lofts on the market today. Great Configuration: The large upper deck greatly increases space in your classroom. These units are designed without visibility on the back panels, for placement against a wall. Endless Possibilities: The open lower half can be used for a play kitchen area, dress-up play, and more. It includes a colorful puppet theater for imaginative play. 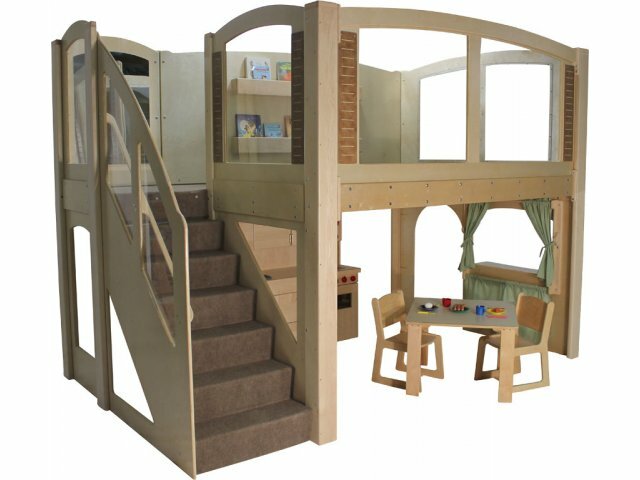 Crawl Space: A crawl cubby space under the stairs is the perfect place for children to sit and socialize. Super Safe: Carpeted steps with a low handrail help children maintain balance and protect against trips and falls. Unbreakable: Lexan windows keep children within view as they play, read and interact. Durable Construction: Built with solid maple and Baltic Birch plywood coated with three layers ofeco-friendly waterborne finish.